Fire Safety Rocks: Celia Clinton Fire Safety Presentation! Tango, Firefighter Dayna and myself, along with the assistance from firefighters from the Tulsa Fire Department, made a fire safety program at Celia Clinton Elementary. This program was sponsored by our good friends from the Rotary Club of Tulsa. We had so much fun! We enjoyed our visit back to the school and had the best time! 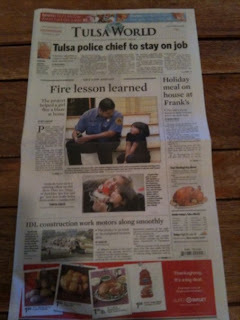 To learn more about this incredible day, click on the picture of the Tulsa World newspaper below. More information on how I have helped save the lives of children and their families may be found HERE.